These muffins are the cutest. 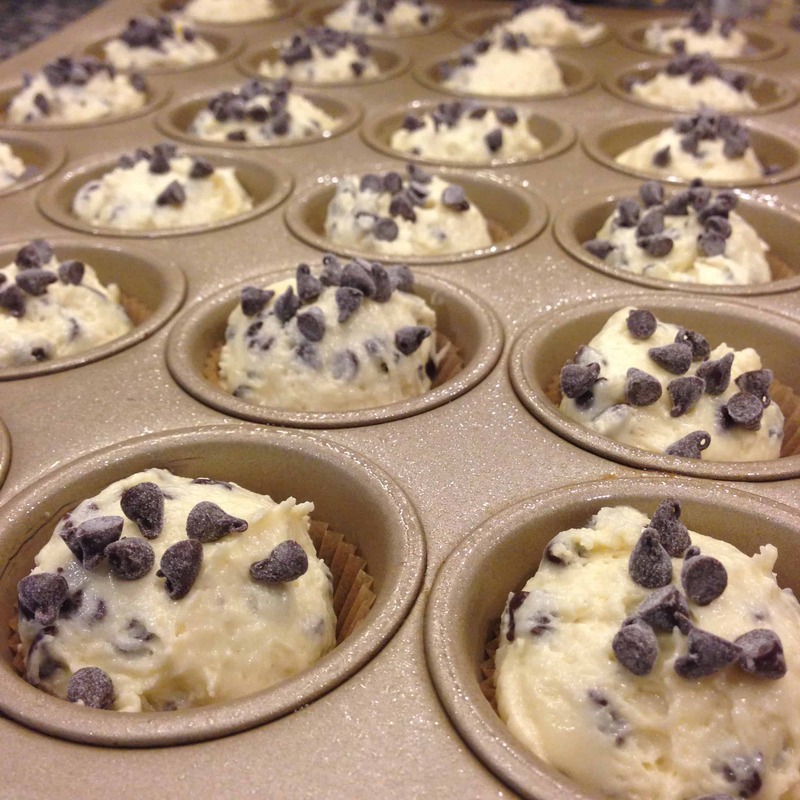 A double dose of mini, I use mini semisweet chocolate chips and I make them extra cute by using mini muffin tins. You could certainly make them regular size, and use regular chocolate chips without losing any of their deliciousness (though, you will lose some cuteness I’m afraid). They are so moist, have a perfectly sweet vanilla flavor, and a balancing tang from the sour cream. Bake a batch and see why we love them so much! Yesterday was a snow day, the first one of the season, and although I was a little irritated that it decided to happen after my semester was over and on a Sunday, I still loved it. I loved seeing my daughter’s excitement; it reminded me of how I used to feel every time I pressed my nose against a cold window to watch snowflakes fall. It also reminded me of when my son was very young, about 2 1/2, and I picked him up from daycare early one day, just as the first snow started to fall. It was late November–we weren’t really in the full Christmas swing yet–but when he saw the snow he screeched with excitement, “Santa! Santa is coming soon!” and my heart melted. There is something magical about snow, something I’m glad I never lost when I grew up. A magic that is described so beautifully in the following quote–a quote that I loved so much I tore it out of a magazine years ago and have had hanging in a frame in my office ever since. Something I love, love, love to do on a snow day is bake. Big surprise. And since I had been eyeing this bag of mini chocolate chips in my pantry for a week or so, wondering what I was going to do with them, the snow day was the perfect opportunity to put them to use. This batter is a blank (but incredibly tasty!) 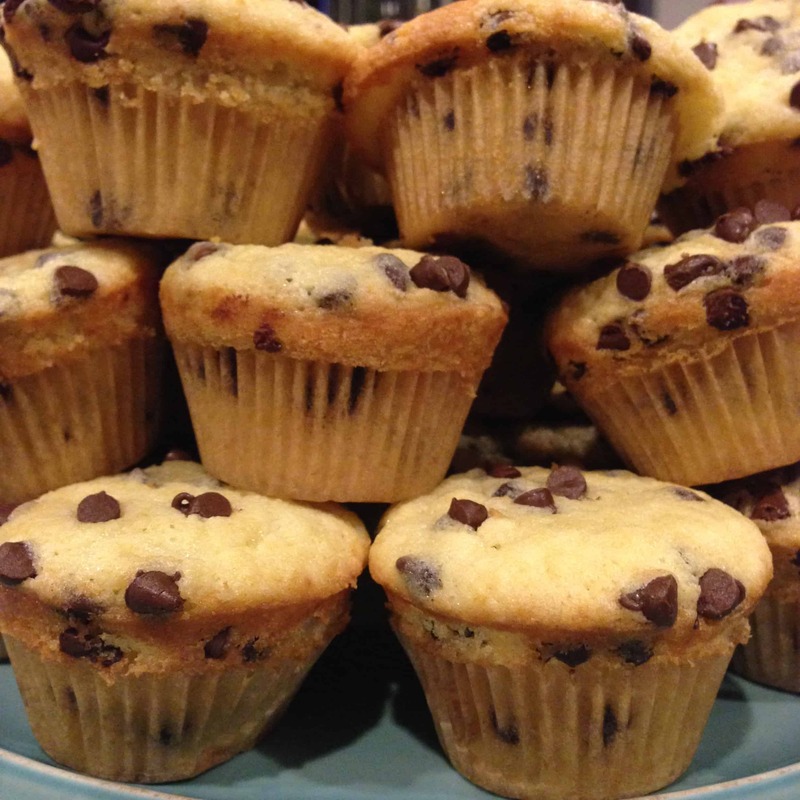 slate, meaning you can use it for any kind of muffin, but the chocolate chips are really, really good. The trick to keeping them suspended and evenly distributed in the batter is to mix them with a tablespoon or two of flour, just enough so they’re evenly coated, before you add them to the mix. This works for anything you’re stirring into batter, and if you’ve ever had your ingredients sink to the bottom of your muffins, this trick will make you very happy! Place paper liners in muffin tins, and for a little extra insurance give them a very light spray of nonstick cooking spray. Stir dry ingredients together in a bowl and set aside. Reserve about 1/4 cup of chocolate chips for sprinkling on top, and place remaining chips in a separate bowl. Add about two tablespoons of the dry ingredients to the chips and toss to coat. In a stand mixer, cream butter and sugar for about 5 minutes until light and fluffy. Add eggs and mix to combine. Scrape sides, add sour cream, vanilla and milk, and mix once more until combined. With mixer on low, add dry ingredients, then quickly add the chips that have been dusted with flour. Do not over mix. 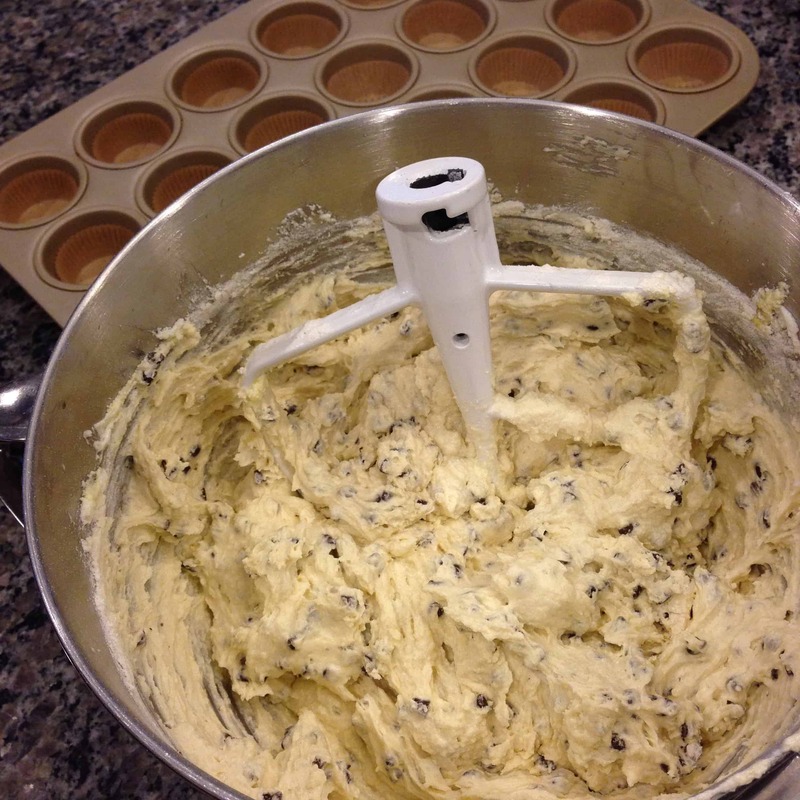 Once chips are just incorporated, turn mixer off and give the batter a final mix by hand with a rubber spatula, making sure to scrape the bottom. 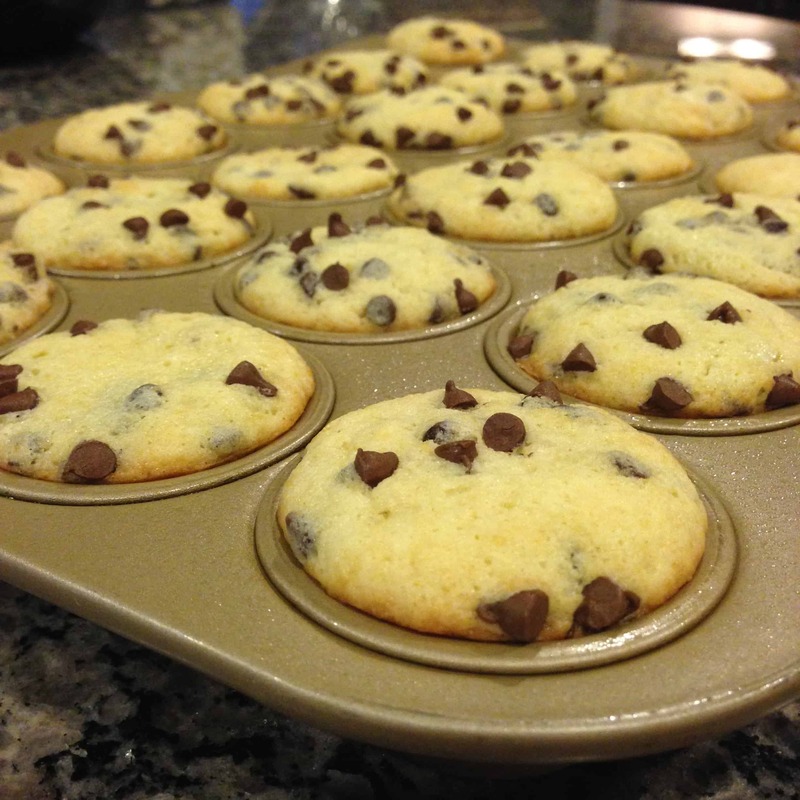 Fill muffin tins to the top, and top each with a few chocolate chips. Bake for about 20 minutes, until just cooked and a toothpick comes out with a few moist crumbs attached. I made this recipe tonight and because of what I did – or didn’t – have on hand for ingredients, I substituted plain greek yogurt for the sour cream, and tap water for the milk. (I couldn’t believe I didn’t have milk!) I’m a baking novice and knew when I couldn’t stop eating the batter that these muffins were going to be amazing. Indeed! They are out of this world! I’m not sure if the sour cream gives it the same texture/sweetness that the yogurt does, but I would imagine it’s very similar. They are great, thanks so much for sharing! Thank you so much for the comment! 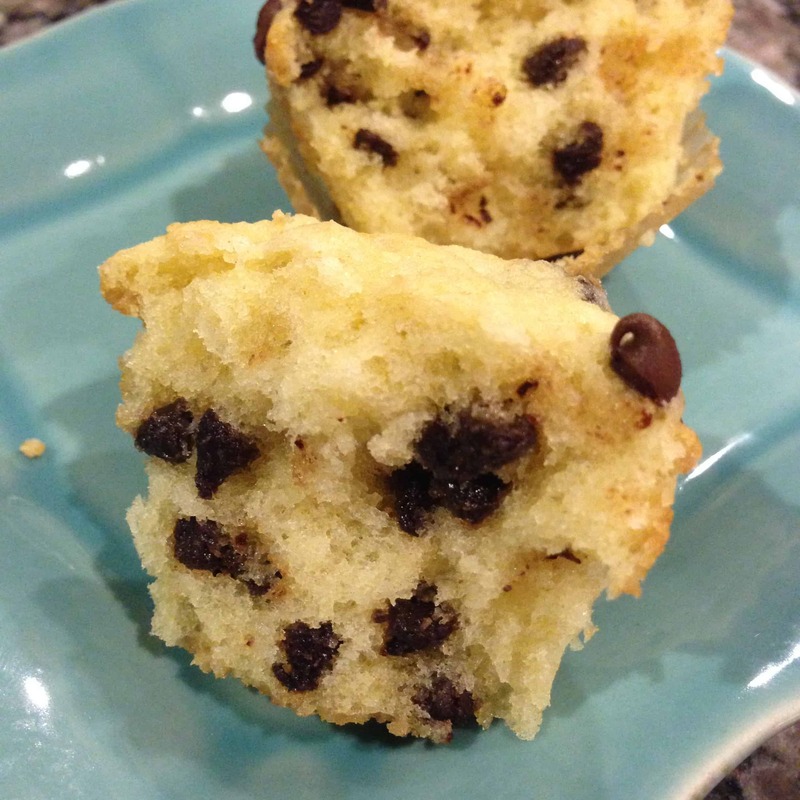 I am so happy you loved them and were able to tweak the recipe and still have success! Those are my kind of recipes! Take care and hope to hear from you again!! Made these tonight. They are amazing.